The last eight years have been marked by avoidable pain and unnecessary division. Putting this miserable period of Greek history behind us is necessary and welcome but it does not give anyone a licence to paper over the failures (in Greece and abroad), play down the burden shouldered by much of Greek society, nor to ignore the dangerous cleavages that have opened in the country’s politics. This is not the time for those who have been directly involved in managing the crisis to claim victory or for those who have been observing developments from a comfortable distance to argue that their views have been vindicated. It would be better if they spent some time thinking about the ways in which they have exacerbated the situation. Eurozone decision makers tried to come up with ways to address a crisis they were woefully unprepared for, while International Monetary Fund economists attempted to find policies to turn around a broken economy. Both have accepted in their own ways that some of the decisions they took made things worse at certain points along the way. Operating within narrow political confines, some of which were created by the moralistic way in which they approached the matter from the start, European politicians time and again came up with solutions that were sufficient to protect their own countries from the effects of the Greek crisis and just about enough to keep Greece from going under. A definitive solution has always been out of reach, even now that eight years have passed since the first bailout. These officials have defended themselves by insisting that they acted in the name of solidarity, but this increasingly appears a meagre fig leaf to cover up for the inadequacies of their decisions. Meanwhile, foreign analysts and commentators saw in Greece a chance to verify their theories, be they about the evils of austerity, the benefits of belt-tightening, the futility of the euro or the unshakeable power of European unity. For many of them, Greece became a socioeconomic experiment to be viewed with a comforting sense of detachment, rather than an actual country with real people and flawed politicians facing harsh choices limited by a narrow political framework. The world’s media also joined those who trained their eyes on the Greek crucible, searching for a way to explain a complex story to a befuddled, and perhaps disinterested, international audience. Some journalists chose to (or were given the ability by their editors) to delve as deeply as they could, trying to understand the country and its history, culture, politics, economy, institutions, society and mentalities. Others just latched onto the closest narrative available (Greece’s untrustworthiness, the Greeks’ deficiencies, popular discontent, street riots, economic hardship, the rise of the far-right, the eurozone’s structural and political shortcomings, the surge of the radical left, the clash of 2015 and the allure of Yanis Varoufakis). Domestically, there were also those who approached the crisis as if it were a soap opera playing out on their TV screens rather than a series of events causing real upheaval for hundreds of thousands of people around them. This included those elected to deal with the problem. From the start, the crisis was seen as an ideal opportunity to score points over political rivals. The PASOK government in power in 2009, when Greece’s finances were discovered to be in dire straits, tried to tackle the problem on its own and to expose the failure of its predecessor, New Democracy. 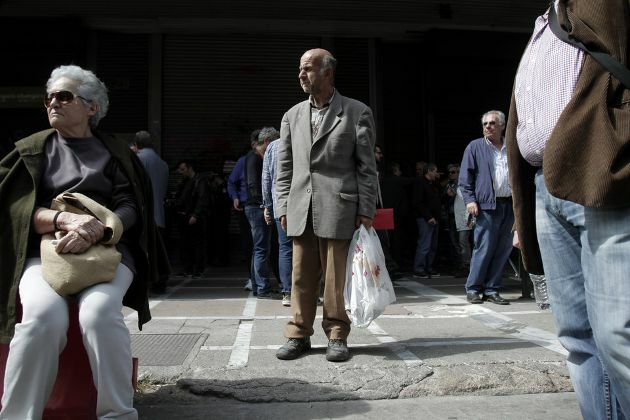 The conservatives, in opposition, chose in 2010 to reject the only option available to prevent a disastrous default (the EU-IMF bailout) and then blamed PASOK for wreaking economic devastation. In this polarised environment and as the economy continued to slide, SYRIZA began to build up its following by criticising both mainstream parties. When PASOK and New Democracy formed a coalition in 2012 to implement the second Memorandum of Understanding (MoU) but failed to deliver any tangible improvement, the leftists’ path to power was secured. Still in its ideological bubble, SYRIZA came to power with the right-wing Independent Greeks (ANEL) in 2015 (another product of the pro-MoU vs anti-MoU divide that had developed since 2010) and thought it could magic its way out of the fiscal straightjacket Greece had been placed in. But Alexis Tsipras proved more Beatrix Potter (author of fairy tales) than Harry Potter (young wizard). Since then, SYRIZA has spent the last three years justifying its decision to agree a third programme, after adding to Greece's financial woes, and implement the austerity measures that came with it, despite more than 60 percent of Greeks seemingly voting against this option in a hastily-arranged, outlandish referendum in July 2015. This has allowed its predecessors, particularly New Democracy, to go on the front foot. The conservatives have tried to scrub out from people’s memories anything that occurred in Greece before 2015, pretending that the country was a shining example of fiscal probity, sound economy policy and trustworthy institutions until SYRIZA arrived on the scene. These political games (which played out against a backdrop of unprecedented recession, alarming unemployment and rising poverty) also seeped into the Greek media, eventually dominating the public discussion. In newspapers, and on radio and television those opposed to the bailout conditions clashed with colleagues who felt the MoU offered the only viable way out of Greece’s mess. The debate became poisonous very quickly, with bailout critics being dismissed as populists or uneducated chancers and proponents of reforms being labelled sell-outs or traitors. In this environment, consensus was impossible. Nobody could agree on what had gone wrong or who was to blame, let alone what needed to be done. Opinions were based mostly on bias rather than analysis. This tendency was reflected in the interaction on social media as well. As the crisis progressed, it became a bear pit for fanatics looking to strike each other down with a killer line or disarming data. No room was given to alternative opinions, and facts were only useful as long as they fitted a pre-conceived point of view. Ideological blowhards who are on a personal crusade or believe they are soldiers to a higher cause now dominate Greek social media to such an extent that many commentators and journalists feel the need to mimic them out of fear of going unnoticed or drifting into irrelevance. For many people in Greece and outside of the country, the last eight years have been an opportunity: To test their decision-making capabilities, promulgate their theories, produce an eye-catching story, get one over political opponents or increase their followers on Twitter and Facebook. However, for those living through the crisis, the last eight years have produced nothing but adversity. Jobs have been lost, careers have disappeared, homes have been repossessed, businesses have closed, wages and pensions have been slashed, public services have been pared back to a bare minimum and belief has evaporated. Rather than mark the end of the third and final programme with bombastic speeches, attempts to paint a rosy picture of what has happened in Greece or another barrage of self-serving commentary, we should be contemplating the impact the crisis has had on so many people and how we can avoid such an economic disaster from happening again. After all the noise, a moment of silence would be welcome. 'After all the noise, a moment of silence would be welcome' and APT, for all those who struggled until they could cope no longer and took their own lives to escape the daily poverty they were expected to endure..Maybe today is the day to add up the sad numbers and start to acknowledge the first and most important cost. We have lived through an unbalanced, biased and strategically flawed war and the dead must not be forgotten by ALL countries in the EU. The media too in other countries should show their belated respects, as instead of investigating thoroughly what the greeks were having to cope with, and reporting more widely those tragic cases of people jumping from balconies and rooftops to bring an end to their misery, prefered to call the Greeks simply 'lazy'. The much needed financial help, a safety-net for those already on the borderline of poverty, and support the country and its citizens needed could have been very different had the people of this Union known the full truth of the people's plight throughout all these years. Even now, together, we must be prepared to face the unfairnesses of what has happened and force the IMF and other responsible strategists into calculating and rectifying their mistakes in a compensation package, beginning with the families of the dead. This was a financial depression, as great as the Great American Depression. It is at an end,they say, but lets be honest far too much, for far too long. is being expected of the anything but less than wealthy citizens of this country and although no more firing of negotiating guns are being heard the seriously wounded will not, sooner rather than later, cope. What will happen then?.Enough to think about for a minutes silence!